John Pollock previews tonight's NXT TakeOver War Games event featuring The Undisputed Era taking on Ricochet, Pete Dunne & War Raiders, plus Tommaso Ciampa vs. Velveteen Dream. NXT will be present their final TakeOver of the year tonight from the Staples Center in Los Angeles as part of Survivor Series weekend. We will have an NXT TakeOver POST Show late tonight with Braden Herrington & Davie Portman of upNXT joining me in-studio to review the entire card and take your feedback. The POST Show will be available on both the POST Wrestling and upNXT RSS feeds. 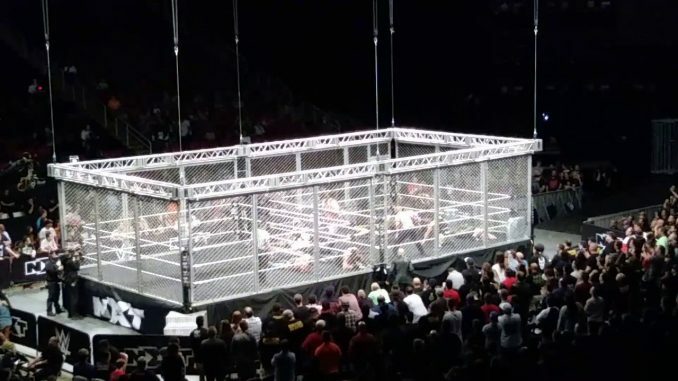 The marquee attraction is NXT’s second version of War Games with the traditional 4-on-4 set up compared to last year’s match that featured three teams of three. The brand has never been so deep with talent and that’s accentuated by who was left off the show compared to who is on. It’s a dilemma NXT faces with so much talent working out of the Performance Center but only so many slots on the TakeOver specials, which are not monthly shows and not marathon events like the WWE’s major pay-per-views. It is worth noting that when the WWE Network has increased the length of its events to increase their total hours of consumption, NXT has remained a one-hour show with quarterly specials that max out at three-hours. Tonight’s card has all the makings of another killer show with four strong matches and the decision made to cap the matches at four with Kassius Ohno and Matt Riddle being taped prior to air on television next Wednesday. With each TakeOver, the booking is analyzed closely with the potential for main roster call-ups present. The roster has lost Roman Reigns for the immediate future and if the company feels there is are any depth issues, it could open the door for NXT talent to fill those holes. Here is a preview of the four matches. The expectations are sky-high for this match and with the talent involved you could be looking at the greatest War Games match in history. These eight are going out to outdo last year’s version and cement themselves with a performance of their careers. While last year there were complaints about the NXT’s version of the match not featuring a roof, this year that opens the options for a performer like Ricochet, who can shine in this environment. Undisputed Era will have the numbers advantage and I would anticipate this match going long. Last year’s match clocked in over 36 minutes and I would imagine nothing shorter for this one. The tag division in NXT has been on fire this year with these eight representing many components of that division, albeit Fish has been hurt throughout 2018. I cannot imagine this match disappointing in any conceivable way given the talent spread out for this. Booking wise, I like the idea of Undisputed Era claiming this to be their match and by winning this one, propels Cole for a rematch with Ricochet and could spin off Pete Dunne with one of the members to feud too. War Raiders challenging for the tag titles again after the disputed finish on television would be a natural direction so there are lots of options for programs. It’s the match I have the highest expectations for and I’m sure many of the guys in the match are treating this as their biggest stage to date. On its own, this doesn’t strike me as a top-level NXT title match and it’s best served as a match where it doesn’t have top billing. Velveteen Dream is so popular, and the audience will make sure this match feels important. I’m in no rush to see Dream leave NXT as he could be a focal point for a long time. For Ciampa, this feels like a pitstop program until Johnny Gargano is ready again to reignite their program or have a temporary alliance given Gargano’s turn. The other big babyfaces in the mix for Ciampa would be Aleister Black, Ricochet and Matt Riddle. I expect Ciampa to retain but in such a way that Dream isn’t hurt by the loss. I would be very surprised to see a title change and I don’t think it would be the right time for Dream and limit the options for the top mix. This would appear to be the conclusion of the feud with a definitive 2-of-3 falls match. I always like the approach to these matches of making each fall distinct and different from the others. Cody and Nick Aldis did this well at the NWA’s anniversary card last month. I also don’t think we will have the negative of rushing through the first two falls to get to the third as that’s always pointless and makes you wish they just did a one-fall match, to begin with. It would make sense for Sane to have her own back up to combat Jessamyn Duke and Marina Shafir, who should be involved in some fashion for this match. That would be an easy way to introduce Io Shirai as one of Sane’s backups. I like the idea of Baszler leading her group with Duke and Shafir and running roughshod on NXT programming. The idea of calling up Baszler to the main roster isn’t one that’s pressing as it’s not the time to do it with Duke and Shafir nowhere near ready and are better served to be working with Baszler on NXT than by themselves. I’d like to see Baszler keep the title, but it seems to be set up for Sane to get the last laugh after Evolution and leave with the title. It’s difficult to forecast where the loser goes after this program. This could be the best match on the show and has been the big storyline over the past few months. I thought the level of detail regarding who attacked Black was well-done, you had logical suspects and intertwined the world of NXT around this one attack and showed motives for multiple suspects. The payoff was well-received and the culmination of Black storming into Full Sail University and laying out everyone in his path was among the better babyface scenes on WWE programming in a long time. There are two directions to go with Gargano, one being that the evil side he’s embraced yields results and he manipulates his way to victory. Or, Gargano fails, and he realizes this is not who he is and must re-examine everything and his momentary lapse reinvigorates his pathway to the title and returns to the side of good. It’s a total superhero babyface story they are telling with Gargano and it seems people are on board with it and trusting in the NXT creative to deliver a payoff at the end that is worthy of their investment in seeing such a lovable character turned for the sake of a larger story. I prefer the latter with Black winning the match and sending Johnny “Failure” down a darker path of re-examination before coming out the other end and works his way back to the title scene by WrestleMania, which should be the climax of the Gargano story and character in NXT. From a story point of view, this match has a lot of meat to it and has been built effectively.